NBC announced that runner Usain Bolt will donate $50,000 to the Sichuan earthquake victims, his thanks for a wonderful time in China, where he has won three gold medals while breaking three world records. Someone said it must be the Chinese food, but I've heard that Usain has been eating lots of chicken nuggets in China. His father said it was the Jamaican yams that has made him so fast. On the other hand, swimmer Phelps got his energy by eating breakfasts for ten. The Bird's Nest and the Water Cube must also have good feng shui for all the athletes who broke world records there! Bolt says he was just having fun. Comment: reader indicates that Bolt first announced his donation for the earthquake victims at the press conference hosted by the International Sports Press Association. It takes 3 avocados and half a pint of heavy cream, plus milk, lemon juice, and sugar to make this recipe for avocado ice cream I found in As the World Churns, a Pennsylania Dutch Mystery with recipes by Tamar Myers. There are also recipes for Amish style chocolate, honey, creamy orange, and butter pecan ice cream. The book's main character Magdalena Yoder of Hernia, Penn., an Amish/Mennonite innkeeper, charges her guests extra for the "full Amish experience" - in other words, they pay more to make their own beds and help with the chores! I enjoy the puns and wit of the hilarious Magdalena. The setting for this mystery novel is a cow competition, the Hernia Holstein Competition, which brings out-of-town farmers and their prize Holsteins to Magdalena's PennDutch Inn, which puts up man and beast alike. The cows are put up the barn, of course. The death of an old vet who claims to find something strange about one of the cows' udders puts Magdalena in sleuthing mode. I'm reading on to find the outcome. Drugs in the udder? Radioactive milk? A Holstein that's not a Holstein? You can never tell with mysteries! Pet sitter Dixie Hemingway lives on Siesta Key, a small island off the coast of Sarasota, Fla. She has become involved before in solving crimes while doing her rounds taking care of other people's pets. 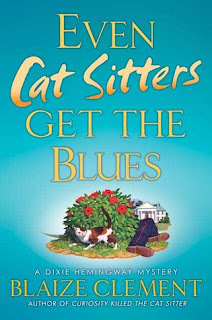 This time in Even Cat Sitters Get the Blues, she takes on a five-foot iguana and its owner, feeding them and making sure they make it out of their funk. The iguana was left in the cold and its body temperature had dropped to dangerous levels when Dixie found it. The owner is ill with some unknown malady that makes his skin dimpled and blue-green. When the owner's security guard is shot dead, Dixie gets caught up in the drama of Who Did It, all while recovering from her own "blues," the death of her husband and daughter in an car accident several years ago. Dixie is a down to earth, gutsy main character, whose love of animals belies her tough stance toward many humans. I'm really enjoying this book, even more than the previous pet sittery mystery by author Blaize Clement, Duplicity Dogged the Daschund. I hope to get through all or part of It Happened In Peking by Louise Miln, published in 1926. Setting is during the Boxer Revolution in 1900, when foreigners were not welcome in China. One hundred and eight years later, 2008 in Beijing, foreigners are much sought after and being made more than welcome at the 2008 Olympics. Ah, history! Also hope to try to read Kinshu, Autumn Brocade by Teru Miyamoto, in translation, and Shame in the Blood by Tetsuo Miura, a literary prizewinner in Japan. Then there is The Strangeness of Beauty by Lydia Minatoya, about an American born woman who returns to the strict samurai family of her mother in Japan. All fascinating novels that may reveal more about Japanese traditional and modern culture. These books are all at home, borrowed from a library, waiting to be read. I've just started Sujata Massey's novel about the Shimura family's cousins in Hawaii. Found out that some Japanese Hawaiians speak an old fashioned version of Japanese and use words differently, dropping parts of words that made them more formal or polite. As the World Churns, a Pennsylvania Dutch Mystery with recipes, by Tamar Myers, though I prefer her Den of Antiquity mystery series, one of which, Death of a Rug Lord, I just finished. Tamar Myers by the way, according to her website, is the child of Belgian missionaries who had her while they were living in the Congo. Now this may be true or it could be a made up story, much like the ones she creates in her Den of Antiquity books. I suspect, however, that her web page gives her true history, which is as interesting as some of the characters in her novels.